Targeted chromosome engineering has facilitated the development of new deletions that now cover virtually the entire genome of Drosophila, providing greater precision and resolution. 'Deficiency', Calvin Bridges' elegantly titled 1917 paper, first described the deletion of a contiguous region of the Drosophila genome containing several genes . Over the years the fly community has built upon this concept to generate a collection of deletion-bearing chromosomes such that a core deficiency kit covering much of the genome was available from the Bloomington Drosophila Stock Center (BDSC) by the late 1980s. In this issue of Genome Biology, Cook et al. describe the culmination of work at Bloomington to bring together a second-generation deficiency kit with increased genome coverage, improved resolution and precise breakpoint mapping. The traditional deletion collection has been, and continues to be, a very valuable resource in the fly geneticist's toolkit, facilitating many of the genetic analysis approaches for which Drosophila is renowned . First, deletions provide definitive null alleles for the genes they uncover and are used to gauge the severity of any particular allele; indeed, the classical test for defining an amorphic or null allele is to assess whether the homozygous phenotype is as severe as when the allele is hemizygous with a deletion. Second, the deficiency kit allows rapid mapping of a mutation to a small region of the genome by simply crossing the mutant stock to a set of deficiency stocks and assaying for lack of complementation. A third and very powerful use of deletions is in pathway-expansion experiments. In these cases the objective is to find genes that are likely to interact with a gene of interest and this is readily achieved in an enhancer/suppressor screen, where the phenotype of a mutation is weakened or strengthened when the dosage of an interacting gene is reduced. The deficiency kit also provides a useful route for identifying genes suppressing or enhancing novel phenotypes generated when ectopically expressing a gene of interest using the Gal4-UAS system . In both cases, screening the 270 fly lines that made up the original deficiency kit rapidly identified relatively small regions of the genome containing candidate interactors. While it is clearly a very useful resource, the traditional deficiency kit suffers from limitations for two principal reasons. First, the collection was brought together from deletions generated in many different laboratories over several decades, and as such it is not in a genetically homogeneous background and individual chromosomes may carry additional unmapped mutations that can complicate subsequent analysis. Second, deletions were for the most part generated by X-ray or chemical mutagenesis and the exact breakpoints of most deletions have not been determined; therefore, it is not clear exactly which genes are uncovered by each deficiency. The possibility of circumventing these limitations was realized with the development of targeted recombination methods in Drosophila, in particular the yeast FLP-FRT system that Kent Golic first introduced into the fly . Building on this, Golic and Golic  described how recombination between FRT sites carried on different chromosomes could be used to generate targeted chromosomal aberrations such as deletions and translocations. The principle behind the system is illustrated in Figure 1 and the FRT-bearing RS P elements developed for these elegant genome engineering approaches were used by the European DrosDel consortium to generate a collection of insertions for building a set of new deletions . Using a conceptually similar approach, in this case with FRT sites carried on a set of piggyBac (WH and RB) and P (XP) transposon vectors, Exelixis Inc. also created a collection of new deletions . In both cases, the deletions based on recombination between mapped FRT sites have their breakpoints located on the genome sequence with nucleotide resolution and thus the problem of precisely defining the extent of each deletion is solved. In addition, each of the two collections was generated in a uniform genetic background and although these are different between the screens, it considerably reduces the genetic heterogeneity compared with the traditional collection. While neither of the new screens covered the entire genome (DrosDel covered 77% of the genome and Exelixis covered 56%), they did generate a combined total of around 20,000 FRT insertions across the fly genome with the potential to produce an estimated 500,000 precisely mapped FRT-derived deletions (FDDs) each of less than 1 Mb, covering 97% of the genome . The utility of the new deletions and the underlying FRT insertions to the fly community is witnessed by over 500 citations to the publications describing them. In particular, many researchers have used the FRT elements to generate custom deletions in regions of the genome in which they are interested. The Golic FLP- FRT system demonstrates the principle for generating custom chromosomal deletions. (a) A collection of fly strains containing the two variants of the RS P element are generated and mapped to the genome by sequencing. In the case of RS5, the 3' and 5' regions of the white gene (w; shaded boxes) are separated by an arrangement of FRT sites (black arrows) such that the activity of FLP recombinase in cis generates a remnant element RS5r containing the 5' end of white followed by a single FRT site; the small fragment containing the 3' end of white is lost. The RS3 element is similar except that the action of FLP generates an RS3r remnant containing the 3' end of white preceded by an FRT site. Grey triangles represent the ends of the P element vector. 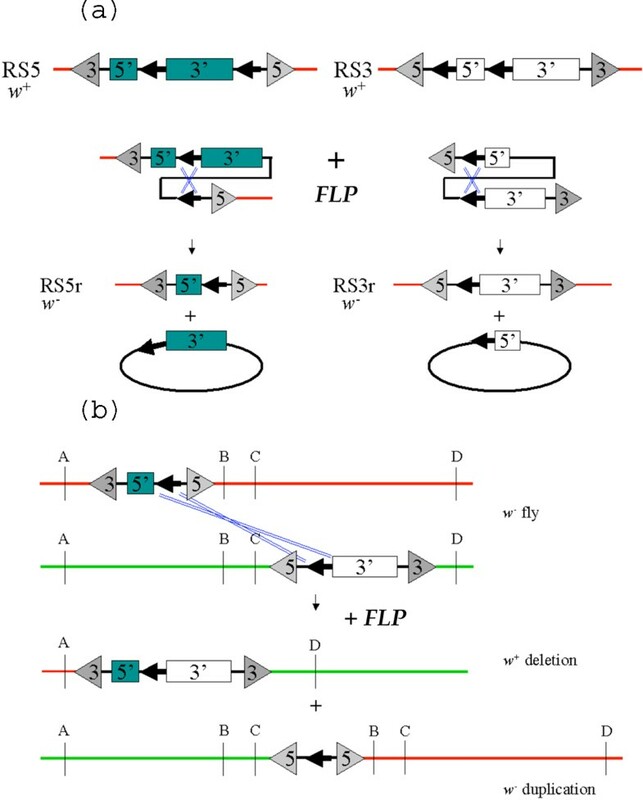 (b) When remnants located up to 1 Mb apart on homologous chromosomes are combined together in a single fly, the activity of FLP recombinase on the two FRT sites in trans generates a reconstituted white gene, deleting the genomic material lying between the two insertions sites. The deletion is easily identified by the presence of red-eyed flies. The reciprocal product, a tandem duplication, does not have a white gene and is relatively unstable. The figure is adapted from Golic and Golic (1996) . The BDSC set out to build a 21st century deletion kit, utilizing the Exelixis FRT insertions to cover all of the gaps in the DrosDel and Exelixis sets and to increase the resolution of deficiency coverage by reducing the average deletion size. In total they produced 793 new BDSC deletions, bringing the combined BDSC, DrosDel and Exelixis deficiency coverage up to 98.4% of the euchromatic genome. The median chromosomal interval between breakpoints now contains only 9 genes, and 377 single-gene intervals exist. These FDDs have been combined to generate the second-generation deficiency kit, a collection of 468 precisely mapped chromosomal deletions providing genome coverage unparalleled in the metazoa and only bettered by the collection of single-gene knockouts available in the budding and fission yeasts. Drosophila is remarkably tolerant of chromosomal aneuploidy and is generally healthy in the laboratory when haploid for as much as 1% of the genome . The exceptions to this are a few haplolethal and haplosterile regions of the genome that, as the designations imply, uncover genes that need to be present in two copies for normal viability or fertility. A systematic analysis of these regions was first described in the 1970s by Dan Lindsley, Larry Sandler and colleagues when they generated a set of Y-autosome translocations to produce an ordered set of chromosomal deletions (and duplications) covering around 85% of the genome . They identified 57 dosage sensitive regions, including 41 Minutes (so called because they share a phenotype of slow development and short thin bristles). Minutes are generally associated with reduced dosage of genes encoding ribosomal proteins or core components of the translational machinery  and these regions represent a barrier to complete genome deficiency coverage since flies carrying deletions uncovering them are generally too sick to survive. While it is possible to recover deletions that include haploinsufficient loci by providing the fly with a covering duplication , such an approach has little utility in a deficiency kit since the duplication must always be present to rescue the insufficiency. Cook and colleagues chose to deal with this problem by generating deletions with breakpoints closely flanking each haploinsufficient locus, thus isolating it and providing close to full genome deletion coverage. In the process they have provided a much more detailed characterization of the haploinsufficient genes in Drosophila, adding one gene to the list of Minutes to bring the current total to 66 and more precisely locating most of the nine non-Minute haploinsufficients. Taken together, the admirable work of the BDSC in producing the new deficiency kit continues the long traditions of the fly community, building community genetic resources with broad utility in the fly laboratory. As well as providing a resource with immediate applications in genetic screening and mapping, it also provides a stepping stone on the way to the ambitious goal of generating single-gene knockouts for every gene encoded in the fly genome.